APD’s unsolicited bid for Yingde – China’s largest independent Industrial Gas provider – looks, at first blush, like the “me too” reaction of a company likely relegated to a distant third place globally assuming the PX/Linde deal goes through. It could be seen a desperate, expensive move, but the only play left for APD. We don’t think so, but it’s unclear what it is worth. We suspect that this has much more to do with manufacturing, design and construction than buying an existing stream of cash flows in China and becoming number 1 in China. It is likely that Yingde solves the one problem that Mr. Ghasemi was always going to struggle to fix. APD lags the other majors in cost of design, construction and operation of most sized air separation units and if Yingde brings this skill set it could be a competitive game changer for APD outside China as well as inside China. This is the question that should be probed in APD’s upcoming earnings call. Yingde may reject the offer or at a minimum extract a higher price from APD, but if the only driver is consolidation in China, we would struggle to see the value. If it is also about becoming the low cost engineering/equipment provider – it may be worth it. PX aggressively cutting costs – APD has caught up in the last 3 years on that front. PX consistently lowering the cost of air separation (ASU) construction – allowing the company to win bids in more profitable/stable markets at higher returns. APD has not, to the best of our knowledge closed that gap – yet! Having spent almost all of the time since the APD/Yingde news hit the tape, sitting in front of clients, on both sides of the Atlantic, the only question was why? Is it a “me too” reaction and Yingde is the only thing left to buy? In which case, it is a low margin business in a market that is decades away from yielding the density required to drive great returns. Is there a specific regional fit with APD within China that will allow APD to improve margins in its own China business? APD would become number 1 in China should the deal go through and there is still growth in China. Is it a bet on a recovery in Chinese Industrial Production growth – if so it is a brave bet, especially if we see some sensible policies and tactics in the US to pull some manufacturing back to the US from China? Or is it something else – is APD buying a low cost design and construction business aimed at dramatically lowering APD’s cost of air separation plant construction around the world with Yingde at its core. If so this could be a smart, but very long-term focused deal. We do not have an answer, and so far, APD has not provided one, but we do know that one of the harder to fix problems the new management team at APD faced was its industry high cost of plant design, construction and operation. It was one of the reasons why APD was losing bids in the West and chasing lower return investments in China where there were fewer bidders. One of Praxair’s early victories in this business was concluding that the equipment itself was the real commodity and that they had to work out how to continually lower the costs of delivering the same sized unit. It is also likely that APD has taken the view that if the PX/Linde deal goes through the US is a marginal market at best for APD. Any new business in the US is going to be won by Air Liquide/Airgas or PX/Linde because they will be able to underbid APD in almost any instance. At the same time Airgas is likely to take business from APD by building new ASU’s in areas of high Airgas density and replacing APD as a supplier. APD might be better divesting the most likely impacted units to Airgas. If being an “also ran” in the US is an inevitability – being No. 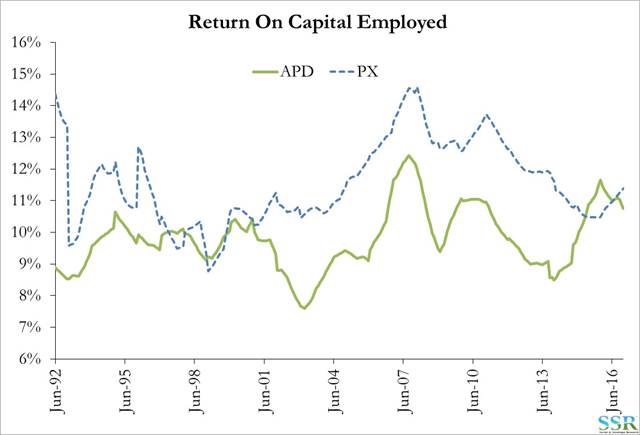 1 in China may be the right strategy for APD. Like the PX/Linde deal, this may be the best 5-10 year plan for APD, but we struggle to see where the value is today – especially in a possible stronger Dollar, weaker Yuan environment and with an administration looking to reward companies investing in the US rather than overseas. If Trump’s policies succeed, might APD redomicile? With only 35% of revenues in the US post the Yingde deal it might make sense.